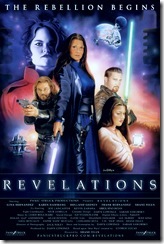 Star Wars: Revelations is a film by Shane Felux’s Panic Struck Productions, now X-ile Pictures. The film tells the story of Taryn, Declan, and Cade who are trying to unlock the secrets of a Jedi holocron all the while staying one step ahead of Zhanna, the Emperor''s Hand. One of the Best fanfilms ever made, Revelations takes full advantage of the visual medium in telling its story. The FX are spectacular. The city on Corellia is deep and fully realized, as is the chase through the Corellian space docks. The attention to detail does not stop with the FX or the costumes, the film also has an original soundtrack that gives a fresh life to the film. The story is engrossing and well written, as is the use of the expanded universe so this tale of the rise of the rebel alliance is firmly grounded in Star Wars setting. The Story is a brilliant use of the Jedi in the time after the destruction of the temple. The Sith are shown with all of the backbiting and mistrust that was fresh to see. The FX are beyond anything you usually find in a fanfilm and rival those used on Scifi Channel productions. The originality of the story takes full advantage of the Star Wars setting without being a retelling of one of the Canon films. The Emperor looks a little strange. The film feels a little short and slightly rushed. Star Wars: Revelations is available for download as is the soundtrack.